We joined a CSA this year, that’s Community Supported Agriculture if you don’t know. Basically, we pay a farmer in advance to deliver us a box of fresh, locally grown vegetables every week. This week we got six pounds of beets. Six pounds! Most recipes call for a beet or two. Needless to say, I’ve been looking for new and interesting recipes that use a lot of beets. This idea was suggested by Erin Anderson on the Diabetic Foodie Facebook page. A chocolate cake with beets? It sounded weird enough that I had to try it. You’d be amazed how many recipes there are for chocolate beet cake, most of which are loaded with calories, sugar, fat and cholesterol. Then I stumbled upon a recipe at FatFree Vegan Kitchen that used no butter and no eggs. I swapped agave for the sugar and whole wheat pastry flour for the white and whole wheat flours. I also skipped the Banana-Peanut Butter Sauce because I hate peanut butter. I thought about making the sauce without the offensive ingredient, but the cake was so moist, it really didn’t need sauce. One pound of beets yielded about one cup of puree for me, so I ended up using one cup of applesauce to bring the total to two cups. Your mileage may vary. This cake is a bit dense and not particularly sweet, but I really liked it. Plus it’s low in Saturated Fat and Cholesterol, is a good source of Dietary Fiber and it used up some beets. Put beets in medium saucepan and cover with water. Bring to a boil, then cover and simmer until soft. (The amount of time will vary depending on how small you dice your beets; mine took about 45 minutes.) Remove from heat and cool to room temperature. Preheat oven to 325°F. 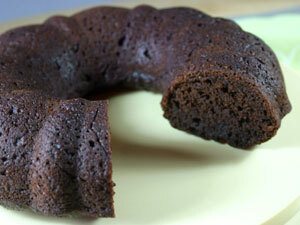 Spray a bundt pan with cooking spray or lightly brush with vegetable oil. Drain beets and puree with ¼ cup fresh water in food processor or blender. Put beets in 2-cup measuring cup. Add enough applesauce to make 2 cups total. Combine the beet/applesauce mixture with the agave, vanilla extract and apple cider vinegar. Mix well. In a separate large bowl, whisk together the flour, cocoa, cornstarch, baking soda, salt and cinnamon. Add the beet mixture and mix well. Pour into prepared bundt pan and bake for about 35 minutes. The cake is done when a toothpick inserted near the center comes out clean. Cool in pan on rack for about 10 minutes, then remove from pan to rack and cool completely before slicing.